When I started a blog almost two years ago, I had absolutely no inkling as to what I was getting myself into. Blogging seemed pretty simple from my reader standpoint--but I couldn't have been more wrong. Now that I'm somewhat a seasoned blogger, I feel more confident about sharing some of the valuable lessons that have presented themselves throughout my experience with this website. 1. Instant success rarely happens. Not much time passed before I as an amateur blogger realized that I wasn't going to develop a steady audience overnight. I wasn't going to gain one thousand Instagram followers in one month. I wasn't going to become an online sensation in a matter of minutes--but really, does anyone? I have always admired bloggers who turn out new content several times a week, especially those who are full-time students like myself. While it is feasible for them to post so frequently, I simply don't have the time to write that many multi-paragraph posts; so, rather than trying to throw together several watered-down versions of what I'd truly like to publish, I've been learning to take the extra time to write a lesser amount of more meaningful articles. 3. Internet friendships are true friendships. The fact that some like-minded people converse through emails and blog comments rather than face-to-face conversations doesn't lessen the "credibility" or the "realness" of the friendships formed online. I've conversed with some truly incredible people via the blogging platform, and I wouldn't want to have that any other way. 4. Software engineers, professional coders, and other various technology-oriented workers deserve a round of applause. HTML coding sounds intimidating because it is (or, at least, it is for someone who has absolutely no prior experience with it). Graphic and web site designers, I salute you. 5. Writing and effective communication skills are essential. Your teachers weren't lying when they said that no matter what field you go into, you must be able to communicate with those around you, whether through spoken words or written ones. Blogging has definitely prepared me for the latter of the two. 6. Don't jump on the bandwagon (if you don't want to). It's difficult to stray away from the crowd, just like it's difficult to break out of the mold of the stereotypical brand-obsessed fashion blogger. Writing for my own website has allowed me to discover a balance between keeping up with modern trends and staying true to my own values. 7. Having unrealistic expectations for yourself is just as bad as having no expectations at all. As I stated above, it really isn't feasible for me to publish four lengthy posts like this one every week because of the limited amount of free time I have on my hands; however, it took me a ridiculously long time to come to terms with that. I kept telling myself that I would have to make more time for blogging, even though that was practically impossible. Long story short: don't allow any unrealistic goals or dreams to cause you an undue amount of stress. 8. Never fall into the comparison trap. Anyone who has been a blogger knows that the comparison trap is one of the most negative aspects of the blogging world. It's incredibly easy to compare your own content and following to the bloggers you follow, and it's even easier to allow that comparison to distinguish others' blogs as "better" than your own. When you start getting discouraged, it's important to remember that you cannot see the whole picture, unless you've actually had access to other bloggers' analytics profiles. After all, it's impossible to compare apples to oranges. 9. If you're going to do something, do it well. If I'm being honest here, blogging isn't always incredibly fun. There have been times (especially during the school year) when I have dreaded typing out another post, for one reason or another. However, I've had to learn that I cannot have such a negative attitude about whatever I'm writing because the quality of it will suffer--and just like in school, I know that if my name is going on it, I have to finish it to the best of my ability. 10. Be proud of how far you've come. After all that's been said and done, I still know that I love blogging--I wouldn't give it up for anything in the entire world. Looking back through my posts is akin to looking through a photo album: from a freshman finding her way, to a sophomore seeking herself, and now to a junior who's looking forward to whatever lies ahead. It's amazing to see how much I've changed, and even if you don't have a blog, it's important to look back and see how you've transitioned into the wonderful person you are today. 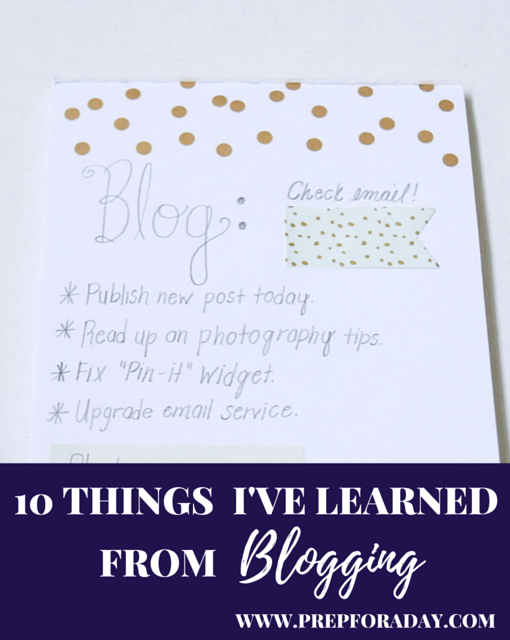 Who knew that blogging could teach so many life lessons? I'm looking forward to learning even more in the future. What are lessons that you've learned from blogging or another hobby? I love these tips! I've found that making a to-do list helps a ton.